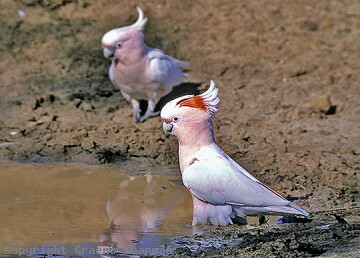 Major Mitchells are arid zone specialists. 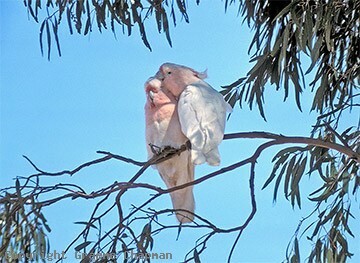 Unlike the Galah which has benefited from the expansion of agriculture and planting of grain and increased its range in many parts of Australia, Major Mitchells are now quite rare and their range has contracted because of the clearing of the woodlands - why? - because they don't eat wheat but instead have to subsist on a broad range of native vegetation which has suffered not only by clearing but also by the grazing of the rangelands. Major Mitchells nest in a hollow, but not just any hollow. Favoured hollows are used year after year by the same birds and in the event of their death, are taken over by others, usually younger birds who have been "waiting in the wings". These sites are very traditional and well-known in the local Major Mitchell community and are spaced well apart, up to several kilometres in some areas. Major Mitchells have a very distinctive flight - several strong flaps followed by a long glide, no doubt an energy saving adaption to flying long distances, which in the arid zone can exceed 10 km or so to and fro from water, which they need daily. Years ago Major Mitchells used to form winter flocks of up to 100 or so, especially in the eastern wheatbelt of W.A. but such a stunning sight is rare these days - a dozen is a good sighting and more often than not you'll see just a pair or a single bird. Don't stick your finger in a Major Mitchell's cage! 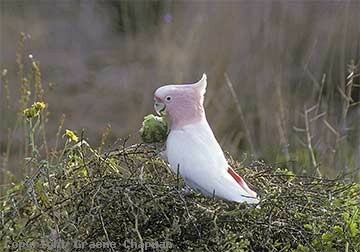 Galahs can bite but Major Mitchells have a much more powerful, crushing bite - useful in dealing with many hard-fruited natives. 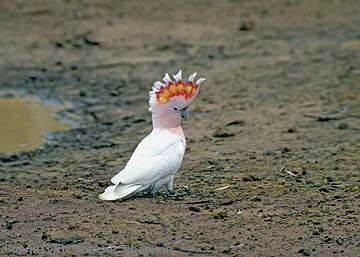 Like the black cockatoos, they can split open the branches of trees and shrubs in search of wood-boring grubs. 270201 ... Male feeding on seeds of Camel Melon. See also Display Print LP-033. 270202 ... Togetherness. Sitting quietly in the shade during the heat of the day.